Regulatory Affairs (RA) is a profession within the healthcare industry namely, Pharmaceutical, Medical Device, Biologics, & Functional Food. Their main role is to comply with Safety & Efficacy of the products as per regulation laid down by the government. They advise companies on all regulatory aspects and laws pertaining to their business such as the promotion of the prescription drug. It is with specific meaning within the healthcare industries. Tech Tammina is established as a professional organization to reinforce and represent these regulatory industries and affairs. In the pharma industry, it is defined as the interface between the pharmaceutical company and the regulatory agencies across the world. The main goal of the regulatory affairs as the profession is to the protection of human health, ensuring safety, efficiency, and quality of drugs with the main accuracy of product information. It helps in analyzing the complicated information including trail data. Tech Tammina offers effective Regulatory Affairs Service for all levels of pharmaceutical, biological and medical device product development industries. We adopt unique strategies to explore full regulatory affairs support services. We have a team of interdisciplinary and flexible resources who can provide responsive and extensive results to your needs. Tech Tammina ensures you to provide benefits to the expertise regulatory professionals. We take the responsibility by contributing to the public health and welfare. Our professional regulatory keeps on tracking the products by carrying out subsequent negotiations that are required to attain the status of products authorization. We are here to offer pragmatic, robust and well-supported functions from the beginning of the development of a product to till marketing the product to achieve success either commercially or scientifically. The three main facets Governance, Risk Management, and Compliance are the most important terms considered to be a shelter for an organization. These three terms are briefly comprised of GRC which mean Governance, Risk Management, and Compliance which helps an institution or any industry to reach its objectives. Tech Tammina standardizes GRC metrics to help our clients to challenge complicated issues caused by corporate or governance, effective risk management and regulatory compliance. Compliance is the term that describes the confirmation of established requirements here. At an industrial level, it is focused on management processes to pinpoint the requirements such as rules, laws, contracts, strategies, and policies to achieve and prioritize compliance. Risk management comprises various processes such as management identifications and reports or information analyzing an organization business objectives. Most companies are challenged with laws and regulations of risk and compliance prior to increasing and protecting their brand product rate. These challenges are achieved only through adopting the appropriate compliance agenda which is a strategic issue for an organization. We empower your organization by navigating the global regulatory requirements, enterprise risk management, and compliance factors. We tackle your organization brand by scrutinizing the extrapolative business model challenges or changes, stakeholder’s expectations, anti-fraud measures, financial reports, and financial advisory services. We provide the disciplinary ideas of GRC metrics that enhance your business that aspires to synchronize information of risk management and regulatory compliance in order to wield more efficiently that authorizes efficacious information, reports sharing, coordination and utilization of people, managing costs. All the various challenges are faced in the highly regulated industries like financial services, life sciences, healthcare that helps in determination of right compliance with roles and accountabilities between business functions and audit. By following these regulatory compliance and Risk Management, the Organizations compliance can be easily improved which reduces the risk of the journey from the volume of values. To avoid risk, the effective approaches to the regulatory change management process involve the high level of engagement. Step by step methodologies is involved in every activity which is involved in the compliance process that directly helps to put a clear focus on the individuals. We offer seamlessly end-to-end process design or redesign with our proven staff of risk management and compliance professionals to make your organization dream come true. 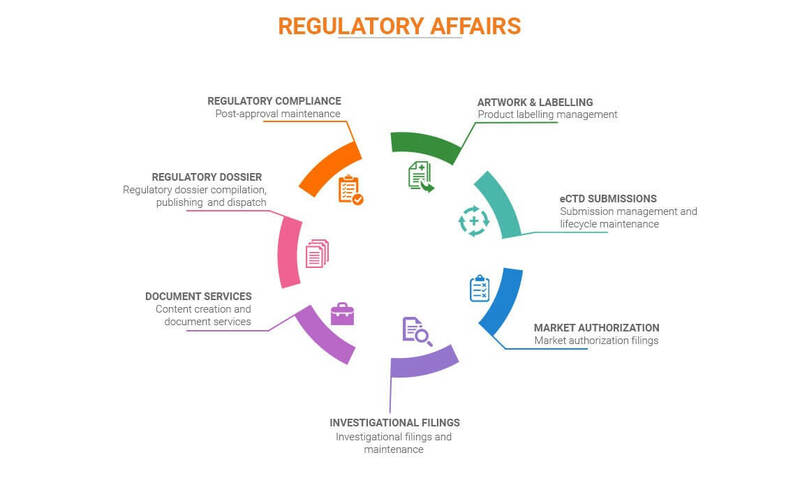 Regulatory affairs help you resolve obstacles while you are trying to launch a new product. Organizations run out to meet most appropriate regulatory Affairs Outsourcing Service company which solves their obstacles in their journey of product launching. If you are looking for the best solution to fix these obstacles, then you are at the right place, Tech Tammina has proven a history of Regulatory outsourcing performance which will throw out these obstacles with certain solution solving mechanisms. RIM or Regulatory Information Management system is a process of observation and implantation of the life cycle process of a product or drug from the starting to the end of product development for which an organization have to adopt primitive measures that are worth for a potential and efficient development of products from beginning of manufacturing, registration of product or drug through the end of marketing of the product. Tech Tammina assists in the globalization of marketing your products, by collecting the complex issues found in the life cycle of the drug, once the inefficiencies are collected then the RIM (Regulatory Information Management) report is generated and landscape solutions are predefined to solve these complex issues. It mainly helps in managing the complex tasks of regulated product authorizations. Extraction of data, transformation and the load services of structured data for data migration. The information can be easily connected to the common usage and establishment of a single source of truth. This implementation methodology required all the clear strategy based on the cross-functional approaches and impacting multiple information management systems. IDMP stands for Identification of Medicinal Products. Tech Tammina is leading provider of fixing IDMP regulations and end to end solutions to support our clients to deliver a high level of quality. At Tech Tammina, our professionals follow complete standards of product development life cycle. Tech Tammina challenges to provide 24/7 and 365 days clients services. Our consultants help to keep up to date to reflect all the required changes in the size and nature of the business. There must be an annual review for business enhancement. We respect and respond as we feel responsible for your request and the registration with us. We spontaneously react to your queries and solve your questionnaires. Tech Tammina contributes to comprehensive expertise Regulatory services. Most of the life sciences companies are facing all the regulatory requirements that can easily develop the market trends to face the real world challenges of satisfying variable requirements in the emerging markets that result in costs delays. It mainly boosts efficiency and ensures compliance to deliver high business value standards. So we came across these challenges and enhance your business and the growth of your products by thoroughly synchronizing with our Regulatory expertise services. If you are sure to meet us, we ensure to deliver strategic, improvised business growth for your organization within a short time. Tech Tammina implements a wide range of support for regulatory affairs through our customer care services. Our professional consultants help and enhance the services in globalizing your products through regulatory affairs. We assist you by providing the appropriate regulatory affairs services. Our ultimate support is available 24/7. Whenever you require assistance drop your query, our team will respond you within a short time. Tech Tammina is therefore called as a responsive organization due to our support to the clients. We believe in “there will be any solution for every problem”. Our clients ring us with a problem but at the end, they cheer with a resolution. So if you are trying for services which have to reduce your regulatory affairs cost, then pick your phone and dial to us. We will guide you the way to reach the best-solving services.